Photo courtesy of Mark Smith, dated 14 July 2007. “SNORTING LIZ” was built as traction engine C/N 18047 by Ransomes, Sims & Jefferies of Ipswich England. Liz started her career clearing land for the Western Australia Land Settlement Board. In 1915 Liz was sold to Mr. B. W. Shepherdson for the Adelaide Timber Co. They found her too heavy for use on wet ground and instead used her as a stationary engine to run their Wilga sawmill. 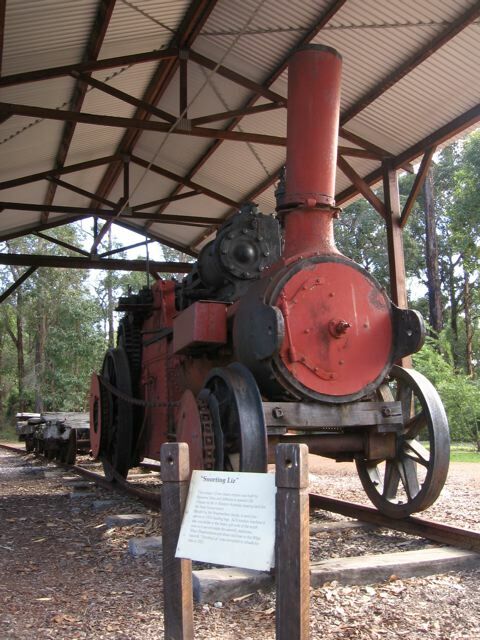 In 1920 Adelaide Timber Co built a steel-railed horse powered tram to move logs to the mill. Horses were soon found to be unsatisfactory and another source of motive power was sought. The next year the Ransomes tractor was removed from the mill and the mechanics went to work. A railroad locomotive needs flanged wheels so a pair of 60-inch locomotive driving wheels and a pair of 39-inch freight car wheels were bought from the local railroad’s scrap pile. With these additions Liz became a 42-inch gauge 2-2-0. With her tractor gearing and drivers 12 inches smaller than her road wheel she had a top speed of about 3-4 mph. Liz was a little short in the traction department so sanders were added. Needing even more power sprockets and a roller chain to power the front wheels were added in 1922 or 23 making Liz a very odd 0-4-0. Because of the different wheel sizes care had to be taken to get the ratio of the two sprockets just right. This interesting relic is now displayed under a weather roof at Wilga.